Anna Minton’s description of the housing crisis gripping Britain, and particularly its epicentre, in London, is punchy and comprehensive, bringing together a wealth of existing research, punctuated with her own interviews and anecdotes in a short and affordable paperback. She begins with the vast amounts of global capital flooding the London housing market – much of it from overseas investors and much of, she argues, citing Transparency International, from dubious sources. Low taxes and loose regulation has made London a destination for a global elite who want, as one billboard marketing luxury flats in Newham’s Silvertown put it, to be ‘Just six hours from New York – just three hours from Paris’. Today London is home to 134 billionaires – more than New York. Minton cites Transparency International’s research showing that London real estate is also a prime destination for money laundering. She goes on a ‘Kleptocracy tour’ of what estate agents describe as the city’s ‘golden post codes’, inhabited by ‘ultra-high net worth individuals’. The bus travels from Westminster to Highgate, past houses owned by the wife of a Russian minister, the son of a deposed African leader, and a Ukrainian oligarch who was arrested in 2013 on suspicion of corruption and forming a criminal organisation. Many of these homes remain empty, as investments; in March Le Monde Diplomatique showed how 39% of homes worth £1m-£5m are unoccupied; for those worth more than £5m, the figure is 64%. Minton argues that ‘global capital and foreign investment are being allowed to reconfigure the city’, driving out the ‘normally’ wealthy to slightly less desirable postcodes; they in turn displace those on moderate incomes and so on, until the very poorest are decanted to far-flung boroughs and out of London altogether, or forced to rent a bed space in a room of four, or 12, or 20 people in poorer suburbs. But while she chronicles this phenomenon well, beyond saying that this is the inevitable result of returns on capital being higher than economic growth – by which one assumes she means investment in production – she does not explain it, nor investigate how the billions of pounds that flow into the land and housing market are the life of blood of the City of London. Nowhere are the super-profits generated by British imperialism mentioned; indeed she seems to look back with rose-tinted spectacles to a time when Edwardian industrialists were the ones purchasing London homes – at least that wealth, she argues, was home-grown. She visits the London Real Estate Fair and is suitably horrified at the greed and glee with which publicly owned lands and assets are marketed to private developers, and is scathing on the role played by London’s Labour councils; the very first page of the book reproduces the map generated by Architects for Social Housing, peppered with demolition sites where council estates are being ‘regenerated’ across the capital, with the net loss of thousands of council homes. She shows, too, the continuity between the ‘sink estates’ condemned by Conservative leader David Cameron in 2013 and the categorisation by Labour peer Lord Adonis of housing estates as ‘brownfield land’. Her description of the scandalous sale and demolition of the Heygate estate by Southwark Labour council and its assault on the Aylesbury estate, and the battle to save Cressingham Gardens in Lambeth are concise and comprehensive. There is much else that is really useful in this book – its examination of housing benefit as a huge subsidy to private landlords, a factor in driving up rents; the disastrous private finance initiatives pursued by both Conservative and Labour governments, the consequences of Right to Buy. She describes during ‘consultations’ on housing stock transfers and regeneration plans, developers would plant their own lobbyists – or students offered £50 in cash - inside meetings, to heckle and intimidate anyone speaking out against their plans. And yet Big Capital is a fundamentally flawed book. In the introduction, Minton writes: ‘From the removal from their homes of people on low incomes to the use of property purely as profit and no longer as a social good, the active flouting of democracy by businesses and local councils alike, the scandal in housing benefit and the pressure on individuals and families at all income levels, this is a new politics of space’. It replaces, she says, ‘the politics of class’ – and indeed, through the book, the working class is never mentioned, only ‘deprivation’ and ‘people on the lowest incomes’. She argues that as income from rent overtakes income from ‘economic growth’, the battle is essentially between those who own property and those who do not. She is describing a parasitic British capitalism but does not name it as such. Instead she adopts a kind of politics of the 99%. It is telling that she opens the book with an anecdote about ‘the squeezed middle class’, a family on a decent income who have to live in precarious, inadequate and overcrowded private rented accommodation where the heating does not work. That’s not to say that she does not document the lives of the working class, those living in the very worst temporary accommodation. Indeed, she spends half a chapter on the battle waged by Focus E15 in Newham, east London. But there is a profound dishonesty at work here; Jasmin Stone, one of the leaders of the campaign (whose name, tellingly, Minton consistently spells wrong) is portrayed in a patronising light, as is Aysen Dennis of the Aylesbury campaign (a political activist who has spent the best part of a decade fighting tooth and nail to save her home, she is furious that Minton chose instead to depict her as a weeping victim, often too depressed to leave her flat.) In Minton’s descriptions, working class activists are cast as passive victims, not as agents of real change. And while Minton recognises that without a chance meeting between the Focus E15 women and the RCG, the campaign would never have taken off as it did, she is curiously coy about naming us, writing instead: ‘Today Jasmine [sic] and Sam are among the most articulate housing campaigners in London, after their random encounter with an obscure left splinter group – best known for its 1980s anti-apartheid protest outside the South African embassy – helped the campaign to take off where others don’t’. I challenged Minton about this omission on social media and she admitted that it was quite deliberate, as she didn’t want to taint the Focus E15 campaign in the eyes of the bourgeois media by any association with communists. This is dishonest and cowardly; in the first place Focus E15 itself has never made any secret of the debt it owes to the involvement of the RCG. In the second, it reveals Minton’s own desire, as an academic and journalist, for respectability in the world of the mainstream press. Tellingly, Minton sees the young middle-class professionals and better-off working class people involved in campaigns such as ‘Generation Rent’ as key to pushing for better housing conditions. ‘This is a middle class issue now, that people want to talk about’, Betsy Dilner, director of Generation Rent, tells Minton. She goes on to say ‘People think we represent this middle-class professional group, but if you can find a way of making the private rented sector work for the most vulnerable people in society then it will work for everyone.’ But in practice, Generation Rent mostly represents the better-off workers who once would have aspired to own their own homes. 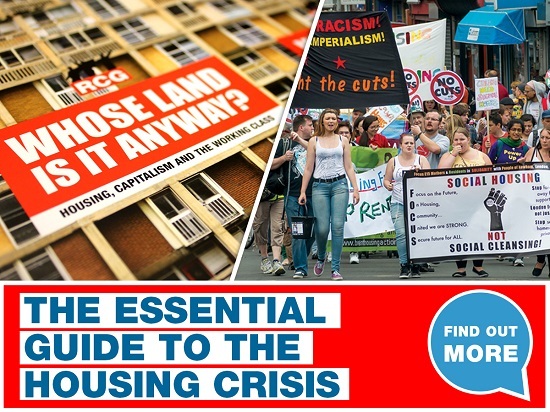 That is not to say that the housing struggle does not encompass these wider forces – but to focus on them inevitably diverts the question away from the class struggle and the inability of capitalism in crisis to solve the housing question. Minton herself looks back to what she sees as a halcyon post-war period: ‘We have an internationally admired housing history…built on a welfare state superstructure created out of the horrors of World War II [but] over the last 30 years – since the fall of the Berlin Wall unbridled capitalism… has brought the market into every aspect of public policy.’ In her closing chapter, after citing the inspiring example of Barcelona’s grassroots anti-eviction campaigns she jumps to some very bizarre and niche solutions in the Netherlands and Denmark. Amsterdam’s DeFlat is a solution for those who can afford £47,000 for a shell to ‘do up themselves’; Slusenhosen in Copenhagen, with its affordable floating balconies and hipster vibe, is a very small-scale project in a city facing rising homelessness. Who are such solutions really aimed at? She extols a European ‘culture of sharing’ (as opposed to an ‘American dog-eat-dog mentality’) as though Britain’s housing policies were simply a matter of political choice, of deliberate policy and willful distortions, rather than a reflection of the extent of the capitalist crisis. Minton calls for practical steps to be taken – a ‘paradigm shift’, she calls it – to ‘rewrite the social contract with regard to planning’, end tax inducements to stop speculative building, develop Community Land Trusts, introduce a tax on land values and ‘determine the role of the state in subsidizing people in housing need’. These are familiar calls on the petit bourgeois left. To give Minton her due, she recognises that there will be no change and no reform without a popular struggle. ‘The struggle for the right to the city… is in turn feeding into a broader struggle for democratic participation in local and national politics, which itself creates fertile ground for a shift in political culture’. But unless such a movement is led by the working class and sees clearly that the housing crisis is in fact an expression of the capitalist crisis overall, it cannot effect any real change. Minton’s perspective makes you have to ask – who is this book really for?